As the lines blur between surveying and GIS, dealers can strategically reposition themselves to provide both services and products. "Bob” is a fictitious project manager for Urban City, USA—and he has a problem that just begs to be solved. The mayor has tasked Bob to complete two missions. First, Bob needs to create survey plats for all of the municipal parks in Urban City. Second, the mayor wants a comprehensive geographic city map of all streets and several municipal assets—light poles, fire hydrants, drainage inlets, and sewer manholes. 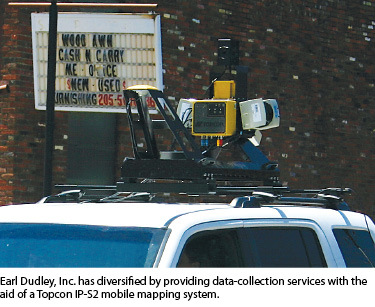 The business model is changing for surveying equipment dealers who have invested in Topcon Positioning Systems’ (TPS) IP-S2 3D mobile mapping system. Such advances in technology allow dealers such as the fictitious one above to sell services in addition to products. Mobile mapping systems are revolutionizing the way we collect data. The standard methodology is based on collecting discrete points for specific features. The surveyor uses a total station or GNSS rover, and the GIS technician uses a GNSS data collector. But the concept is the same: Collect only the specific information we are interested in at the present time. Data collection with an advanced mobile mapping system works on the reverse principle: Collect all of the available information, then extract or “mine” only those data in which we are interested. And mobile mapping is about more than an exponential increase from hundreds of discrete data points to the millions of points that can be collected by laser scanners. Mobile mapping provides comprehensive information: a virtual 3D reality that provides information about not only specific features but also the surrounding setting and context. The IP-S2 merges spherical camera images with colorized point clouds. From the computer screen, an operator can visually get “inside” the area and view it from a 360-degree perspective. Across North America, several TPS dealers have invested in IP-S2 mobile mapping technology. The list includes The PPI Group, Portland, OR; Boyd Instruments, Horsham, PA; Caron East Inc., Cumberland, MD; Earl Dudley Inc., Birmingham, AL; GeoShack, Dallas, TX; Positioning Solutions Company, Carol Stream, IL; and Brandt Tractor, Calgary, Alberta, Canada. A closer look at the experience of one of these dealers reveals how a typical evolution of the dealer/service provider business model develops. Earl Dudley, Inc., was founded in 1938 as a survey instrument repair shop in Alabama and has expanded over the years to operate dealerships in North Carolina, Georgia, Tennessee, and Mississippi. As technology evolved, the company also expanded into equipment sales and application consulting. The key to Earl Dudley’s business success started with a thorough knowledge of the attributes of each product sold, whether it was a sophisticated total station or a simple level rod. It included a working knowledge of surveying objectives and techniques. Couple these with a sincere interest in the customer’s intended goal, and the result is the right product for the right application for each customer. Over the years, the company expanded into other products from TPS’ diverse lines of precision positioning equipment—GNSS systems, machine control, construction lasers, and precision agriculture systems. The addition of each new product required a new business plan and hiring and training staff to maintain the company’s principal objectives. Earl Dudley’s recent venture into mobile mapping brought myriad new opportunities. In March 2011, the company invested in an IP-S2 mobile mapping system. From the start, their intention was clear: use the system for demonstrations to potential purchasers, but also provide data-collection services. Management understood that some customers want to use dynamic 3D mobile mapping data but may not have immediate purchase plans. The 3D data produced by a mobile mapping system is in itself an extremely desirable commodity. The daily, worldwide use of geographic data and street-view imagery produced by major internet mapping providers has raised the expectations of the general public, government agencies, and professionals. When commercial consumers learn that they can have similar tools at their fingertips targeted to their specific business applications and geographic areas, they are motivated to spend money on the data-processing services. As times change, successful companies grow by diversifying and creating new revenue streams. Providing mobile mapping services improves the financial bottom line at the end of the year, and it offsets the initial cost of investment in the system. How does the dealer/service provider determine if a prospective customer is right for product sales or service sales? These two classifications are not necessarily mutually exclusive. Someone who contracts for data-collection services might eventually purchase a system. For example, Urban City has 825 miles of city streets. At 25 miles per hour, it would take 33 hours, or slightly more than four working days, to map the entire city. Adding an extra day for mission planning brings the total time expenditure to roughly a week. The public works department can remap the city once every six months to keep its database current. But how can Urban City justify purchasing a system that will be used for only two weeks out of each year? In this scenario, it would make sense for the city to pay for mapping services as needed. In real life, Earl Dudley is already succeeding as a mapping services provider. The company has completed two paid projects, both suited for mobile mapping. 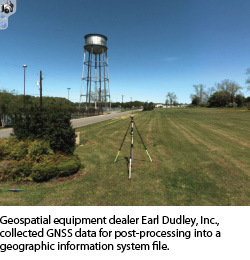 In one project, a GIS consultant contracted for data collection on a military facility in Marietta, Georgia. The deliverables included a processed dataset and a copy of Topcon’s Spatial Factory software. Using these tools, the consultant will build an asset database and a 3D model for their military customer. The second completed project was an engineering mission. The City of Demopolis, Alabama, intends to install a new water tank and supply lines in an established neighborhood. A local engineering firm was engaged to perform a 3.2-mile pre-construction route survey. It will use lidar data collected with the IP-S2 to create cross-sections of existing terrain for design purposes. In addition, the firm will have a complete visual record of site conditions from the 360-degree spherical images. The mobile mapping team set up a GNSS receiver onsite to enable post-processing of the mobile mapping data for high-accuracy results. Four new projects are also on Earl Dudley’s schedule. The GIS consultant customer from the first project listed above wants to map four more military facilities in a nearby state. Two county governments in Georgia are paying for pilot asset inventory projects to determine the feasibility of using mobile mapping for countywide data collection. A town in Alabama wants 30 miles of data collected to map all utility poles and above-ground water installations. The major electric power provider in Georgia wants ground-level lidar to merge with existing aerial data. The list continues to grow. Between projects, Earl Dudley is following through with the company’s philosophy of exploring every facet of a product they sell. Arrington is a licensed professional engineer and is extremely demanding when it comes to product performance. “We have completed numerous test runs and used different data processing techniques,” he said. “We want to understand exactly what level of accuracy we can deliver and the processes required to attain it.” Because data products are the primary deliverable of a service provider, the company is also creating workflows for formats such as cross-sections and contour maps. There is a common thread among each of Earl Dudley’s projects. The client sees mobile mapping as a great improvement over conventional data collection methods and can also see the value proposition that systems like the IP-S2 offer. They do it more quickly, safely, and efficiently, and they provide a higher level of accurate information. Don Talend, of Write Results Inc., West Dundee, Ilinois, is a print and e-communications provider specializing in covering technology and innovation. All photos courtesy of Topcon Positioning Systems.